Ireland’s economy is outperforming most other Eurozone countries with almost full employment and rising real wages. So why are Irish consumers among the most pessimistic in Europe? Although it was among the nations hardest hit by the 2007/8 economic crisis, Ireland’s economy has bounced back. 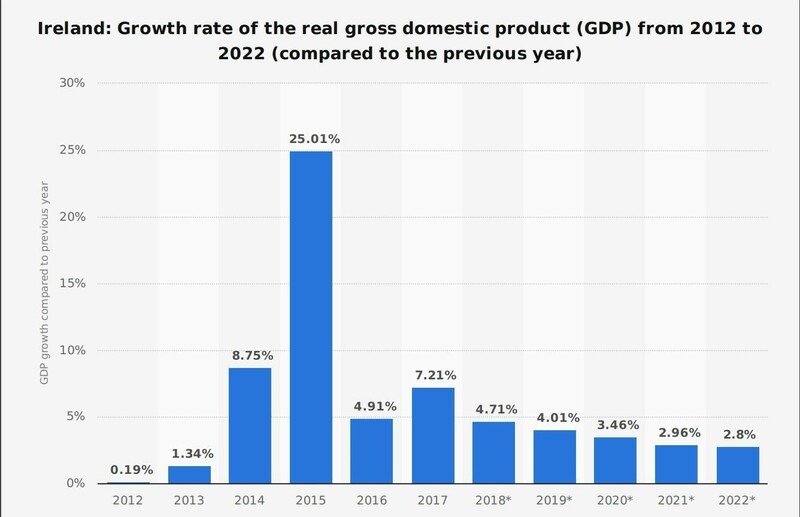 The European Commission forecast in February that the Irish economy would grow by 4.1% this year, the second highest growth rate in Europe. The EU forecast was slightly down on its previous prediction but unemployment is heading down towards 5% and real wages rose by 3.2% last year while pricesincreased by only 0.7%. Income inequality has fallen by 8% in recent years thanks to a big increase in the baseline national minimum wage two years ago. Ireland has also been doing well in promoting gender equality, coming ninth in the World Economic Forum Gender Gap Index ahead of France, Denmark, Germany and the UK. Ireland was ranked 24th out of 137 nations in the World Economic Forum Global Competitiveness Index last year. However, the report highlighted the need to improve infrastructure and cut bureaucratic burdens on business. An OECDreport last year highlighted the need to boost productivity too. The OECD was also worried about the level of non-performing loans held by Irish banks and urged the Irish government to reform the process for tackling mortgage default by homeowners. Without reform, Ireland was exposed in the event of a global downturn, it said. Although Irish life satisfaction scores remain above the OECD average, recent research by the Irish Economic and Social Research Institute (ESRI) found that Irish consumers are deeply worried. Top of the list of concerns are Brexit and public sector industrial strife, including a strike by nurses at the start of the year. Austin Hughes, Chief Economist at KBC Bank Ireland, who wrote the report, said a drop of 12.3% in the Consumer Sentiment Index last month was among the sharpest in its 23-year history and the lowest level since November 2014. Economists agree that the effects of an unmanaged Brexit could be even more severe in Ireland than in the UK and the rest of Europe. Hughes said that although exports to the UK and revenue from UK tourists had both dipped, the worst was yet to come if the UK “crashed out” of the EU without a deal. Reading the true state of the Irish economy has been tricky in recent years. Ireland’s favourable corporate tax regime has been controversial. 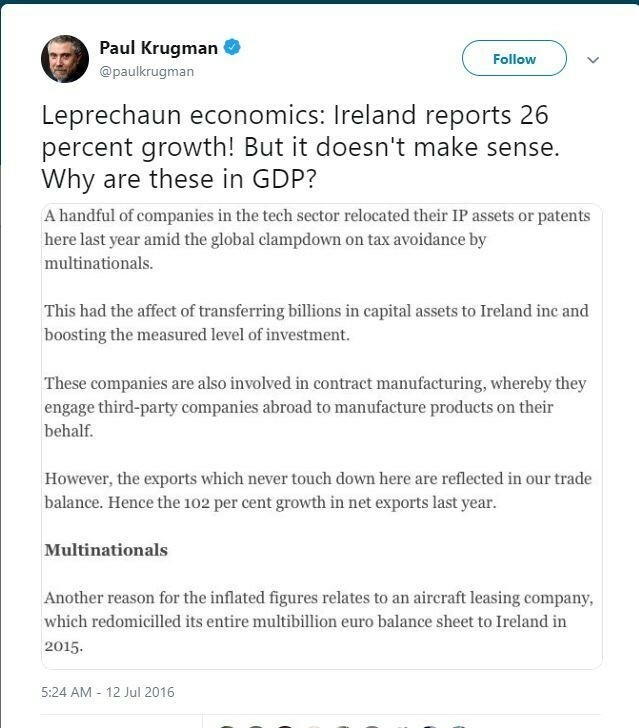 Nobel prize winning economist Professor Paul Krugman coined the term “leprechaun economics” to describe the effect on GDP. In a blog post last year, economist Seamus Coffey, who chairs the state spending watchdog the Irish Fiscal Advisory Council, attributed much of the GDP growthspike to 25.1% in 2015 to one multinational corporation moving its intellectual property rights to Ireland from Jersey to comply with tax rules on profit shifting.Although the growth rate slowed in subsequent years it was still 7.21% in 2017, falling back slightly to 6.7% last year. The Irish Economic and Social Research Institute again cited “multinational related activity” as a factor in GDP levels last year. Consumer spending has been growing but analysis by Ireland’s Central Statistical Office suggests that much of this has gone on higher rents and mortgages, rising local property taxes and water charges. St Patrick’s Day economic bounce? So does the celebration of Ireland’s patron saint offer hope for more economic activity? With the biggest Irish community outside Ireland, a survey for the US National Retail Federation found that Americans planned to spend $5.9 billion celebrating the big day. In Ireland the effect is more modest. The organizers of the annual St Patrick’s Day parade in Dublin estimated that half a million people joined in the fun this year. The Irish National Tourism Development Authority estimates that the event and other festivals nationwide bring €108 million ($123 million) to the economy each year. Are you ready for Microsoft’s Fall Creators Update?